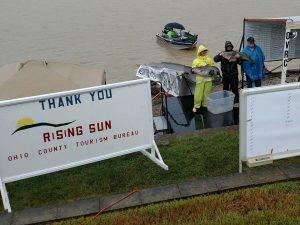 Anglers looking for an entertaining, and possibly lucrative outing, can plan to visit Rising Sun, Indiana on September 8 and 9 for the Ohio Valley River Cats’ 13th annual catfish tournament. The tournament offers guaranteed prize money: $10,000 for first place, $2,000 for second and $1,500 for third. A $1,000 Big Fish Award and a Drift Master Bonus of either $400 in cash or $600 in merchandise is available. A $1,000 prize is available for the most weight by a male-female team, with at least one female as a team member. Fourth through 12th place are awarded between $170 and $400. A team tournament, members can consist of one to three individuals. At least one team member must be 18 years of age or older. All fish must be caught off a boat by rod and reel. Boats launch from downtown Rising Sun. The tournament offers guaranteed prize money: $10,000 for first place, $2,000 for second and $1,500 for third. The entry fee is $50 per person and must include a completed entry form. Pre-registration forms with competition guidelines are available at local businesses and at the Rising Sun/Ohio County Tourism Visitors Center located at 100 S. Walnut Street in Rising Sun during normal business hours. Deadline to register is by 7 a.m. on September 8. Fishing hours are 8 a.m. to 4 p.m. on September 8, and 7 a.m. until 3 p.m. on September 9. The weigh-in is at the City of Rising Sun ramp and is free and open to the public. Everyone is invited to the Mayor’s Special BBQ during and after the weigh-in on Saturday, September 8. For more information on the Ohio Valley River Cats Catfish Tournament, contact Frank McIntosh at (812) 584-2135. The event is presented by the Ohio Valley River Cats and sponsored in part by the the City of Rising Sun, the Rising Sun Mayor’s Office, and the Ohio County Convention, Tourism, and Visitors Commission. Information on events, lodging, and tourist attractions is available by calling Rising Sun/Ohio County Tourism at (888) 776-4786, or logging on to enjoyrisingsun.com.